Kids, especially toddlers as they are learning to walk and seem to want to climb all over everything, often fall and hit their heads. They may fall so much that you may have thought of making them wear a helmet all of the time, not just when they are riding a bike or scooter. Of course, that would be going too far in all but the most extreme circumstances. It is much better to childproof your home, encourage them to wear a helmet when appropriate, and supervise your kids well when they are playing to try to prevent most head injuries. Keeping your kids safe in the car, including using an age-appropriate infant car seat, booster seat, or seat belts can also help to prevent a head injury in a car accident. Accidents do happen, though, so it is also a good idea to know what to do if your child does have a head injury. What Can Cause a Head Injury? A head injury often follows a fall but can occur after any blow to the head. Getting hit by a ball, bat, golf club, or hard toy, etc. Most head injuries in children are caused by falls, though, including infants who might roll off the bed, toddlers and preschoolers who might fall while climbing or trying to walk down the stairs, and older children who often fall while riding their bike, skateboard, Heelys, or a scooter. Older children and teens often suffer head injuries while playing sports, too. One of the scariest things about head injuries is that sometimes, what seems like it should be a minor head injury — like a fall from a short distance — can sometimes cause more serious symptoms than a fall from a second story window. That makes getting as many details about the head injury and your child's symptoms right after the head injury occurs very important. Had a change in behavior immediately after the head injury, such as becoming irritable, lethargic, not remembering the injury or other things (amnesia), or having poor balance, etc. Develops other symptoms after the head injury, such as a severe or a worsening headache, stiff neck, or photophobia (sensitivity to light), etc. In general, a loss of consciousness, seizure, persistent vomiting, or any change in behavior after a head injury would require immediate medical attention. You should also usually seek medical attention if an infant under six months of age has a fall, even if they don't have a loss of consciousness or other symptoms. Fortunately, most childhood head injuries are mild, and the child will not have a loss of consciousness or other serious symptoms. These children usually cry when they first hit their head, but quickly settle down and return to their normal behavior. Be sure to seek medical attention if, even after a very mild head injury, your child later begins to show symptoms of a more serious head injury. You shouldn't let a child go to sleep after a minor head injury. Fact: If you are too afraid to let your child go to sleep, then you should usually seek medical attention for your child's head injury. Most children with minor head injuries that don't have any serious symptoms can go to sleep if it is bedtime or time for a nap. Just check on them regularly (every few hours) to make sure they are sleeping comfortably, but you usually don't have to wake them up unless your doctor has told you to. For most young children, if you keep them up when it is time for bed, then they likely will become irritable, which will make observation difficult. If you don't have any scalp swelling (a 'goose egg') after a head injury, then that means that the swelling went 'inside' and you have a skull fracture. Fact: Most children without scalp swelling will not have a skull fracture. If you don't have a loss of consciousness, then it isn't a serious head injury. 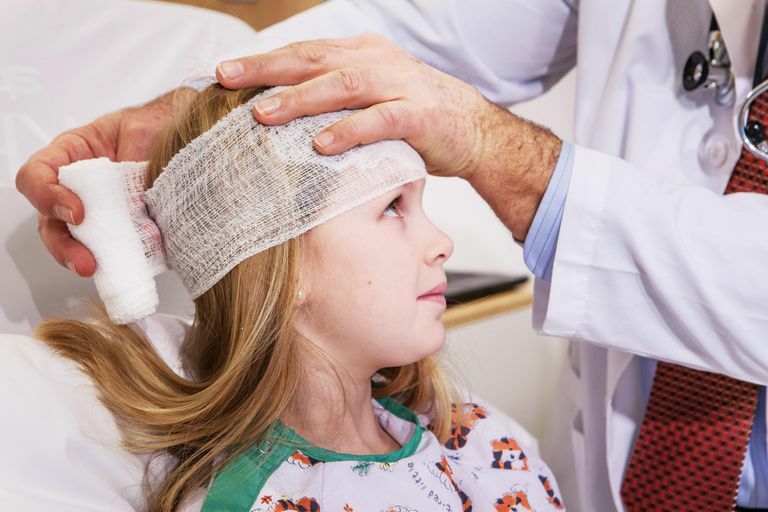 Fact: While your child is more likely to have had a serious head injury if he has a loss of consciousness, your child can rarely develop more serious head injury symptoms after having few or no symptoms at first, including not having any loss of consciousness. Whether or not you go to the ER after a head injury, do follow up with your pediatrician. Even a mild head injury can cause a concussion, which will require a care plan to help your child get back to his usual symptoms as quickly and safely as possible. American Academy of Pediatrics Clinical Practice Guideline. The Management of Minor Closed Head Injury in Children. Pediatrics 1999 104: 1407-1415. Atabaki S. M. Pediatric Head Injury. Pediatr. Rev., June 1, 2007; 28(6): 215 - 224. Marx: Rosen's Emergency Medicine: Concepts and Clinical Practice, 6th ed. Thiessen ML. Pediatric minor closed head injury. Pediatr Clin North Am - 01-FEB-2006; 53(1): 1-26.